The temple is one of my favorite tools. I have a collection of them. I happily use a temple for almost everything I weave. And I certainly wouldn’t dream of weaving a rag rug without one! 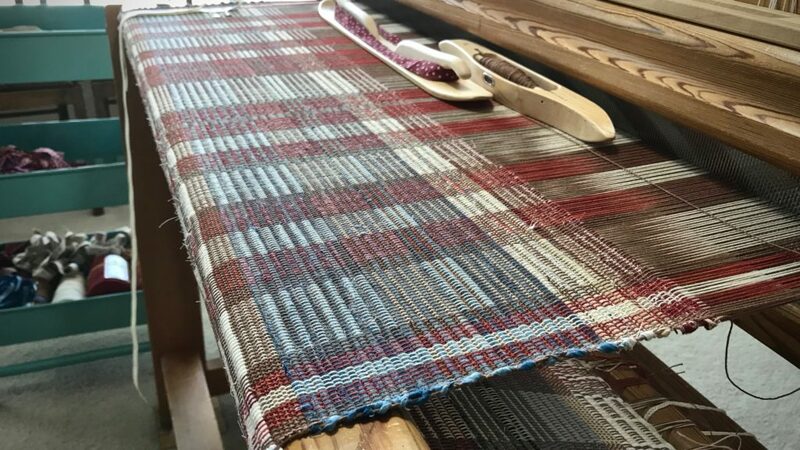 Spaced rep rag rug, using fabric strips and warp thread for weft. You can set the temple into the cloth as soon as there is is enough woven for two or three teeth to sink into. Then, move the temple up when you have woven enough to set all the teeth into the cloth. Even with a temple, place adequate weft through the shed. 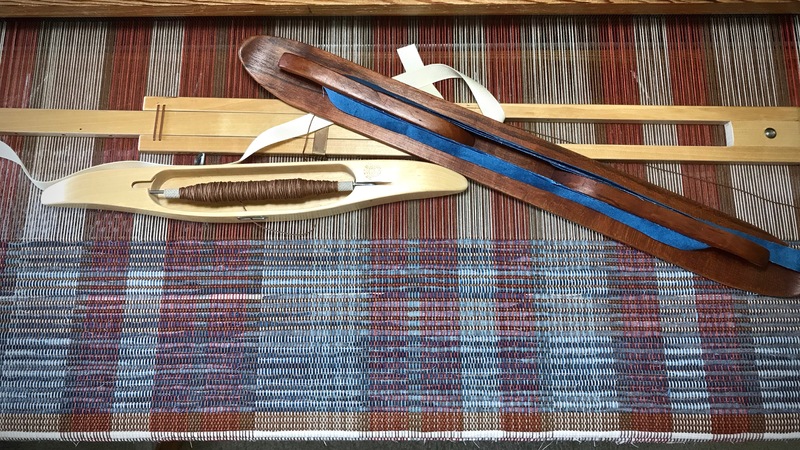 The tool works best in conjunction with careful weaving practices. Watch out for the sharp points! I get pricked when I forget and reach around the selvedge to straighten something out. Make sure the temple is far enough back from the fell line that it won’t scrape the edge of your beater. I have a scar on my beater because it was hitting the temple. Unfortunately, I didn’t notice until the damage was done. Move the temple frequently. For consistency at the selvedges on a rag rug, I move the temple at least every inch. Remove the temple by moving the slider with one hand, while holding the center part down with the other hand. Keep the pin in place and the temple will draw up in the center. Then, disengage the teeth from the cloth on both sides. 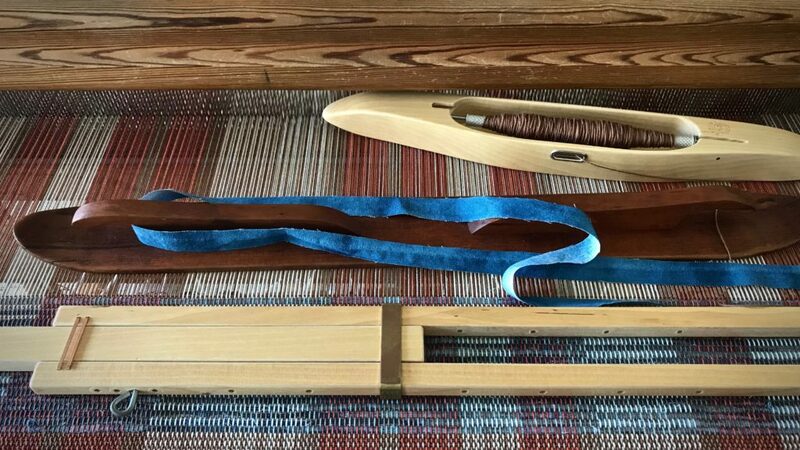 Width in the reed for this rag rug is 90 cm on this 100 cm loom. I keep a supply of temples so that I have what I need for any weaving width. May your tools serve you well. I love these wooden temples. A friends husband drilled more holes in the narrow piece to make mine even more versatile. Hi Beth, You make a good point. It is possible to add holes to these wooden temples. My husband has drilled extra holes in a couple of mine, when I needed it. Thank you for the video on how to set a temple. I appreciated it very much! Hi Cindy, You are welcome! Glad it was worthwhile for you.